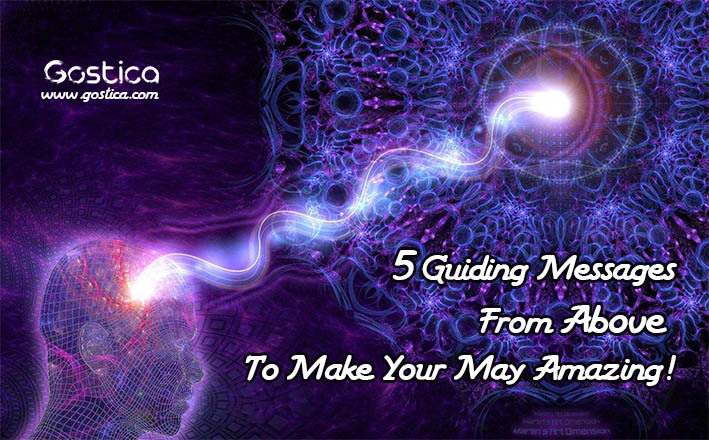 5 Guiding Messages From Above To Make Your May Amazing! 11. CREATE YOUR LIFE VISION. 22. GET YOUR FINANCIAL HOUSE IN ORDER. 33. BE OPEN TO RECEIVING. Angels are our guardians and guides. They are divine spiritual beings of love and light that work with humanity to help us in this lifetime. Guardian angels are unique to each person; we each have our own team. For some people this may be one angel, for others, it may be many, and you can always ask for more if you feel the need. The Angels respect your free will and won’t directly interfere in your life unless asked, or if your life is in danger before your time. When you ask for guidance, your angels will communicate through your intuitive feelings and a variety of other ways. When you are uncertain about a decision, you can always ask them for a sign to confirm your feelings. Signs of the angels help us feel a direct connection, enhancing our intuition and giving us the confidence to move forward. The meaning of the word “Angel” is a messenger; communication and guidance are their specialties. Messages from your angels are always for your highest good; guiding to your dreams, your purpose, happiness, joy, and peace. Your guardian angel(s) are excellent counselors; think of them as your very own Divine Life Coaches. Their guidance is truly for your best interests, always positive, unconditionally loving and very honest, but never judgmental or negative. You can always count on your angels for the best advice, counsel, and information available. With a new month approaching, there is an opportunity for us all to receive Angel Guidance to make May an incredibly prosperous and successful month. April was a month of shifting energies, letting go of what no longer serves our collective highest good to make room for a new paradigm and a new understanding of ourselves. The upcoming month promises to bring each of us amazing opportunities for growth, abundance, and positivity in all areas of our lives if we understand how to harness its potential. The Angels want to help us thrive like never before, giving us guidance, support, and inspiration to dream bigger and step farther into purpose. 1. CREATE YOUR LIFE VISION. You cannot create the life of your dreams unless you know what you want. A vision board that represents how you want your life to look, feel and defines what is important to you will kick start the manifesting for May. It also sets the tone and helps you be much more discerning in all areas of your life, allowing you to set healthy boundaries and live authentically. 2. GET YOUR FINANCIAL HOUSE IN ORDER. You cannot improve your financial situation if you do not fully comprehend what it currently is. Money is simply a form of energy. How you invest (not spend) it sets the tone for your level of abundance and wealth. Prosperity is your birthright, you cannot fully tap into its unlimited potential if you do not fully understand your current habits. Knowledge is power, tracking all money that comes in and out will tremendously help you invest this form of energy in ways that align with your Life Vision. This raises your energy vibration and helps make you a manifesting magnet for increased income streams. 3. BE OPEN TO RECEIVING. Your dreams will only be created by receiving the help of others (including your Angels). If you are not comfortable with stating your needs, setting intentions, receiving or asking for help, you will create roadblocks with your restrictive energy. When you resist receiving, even something as simple as a gift or a compliment, you block the reciprocal give and take nature of energy, making it challenging to receive ideas, inspiration, opportunities, resources, motivation and just about everything needed to manifest. Without open-hearted receiving, anything you actually give is out of balance and likely not unconditional (without expectation). Surrender is the path to manifesting. Letting go of the need to control, be it through expectations or worry or impatience, allows the Angels to work their magic on your behalf. We also need to let go of anything that consistently, negatively impacts our energy; from relationships to possessions, if it isn’t bringing you joy or value in some way consider letting it go. Stop playing it small, safe and scared! May is the month to constantly step outside your comfort zone; it is time to raise the bar every single day. If your dreams feel safe and secure, they are not big enough. This is not about being frivolously unrealistic, it is about giving voice to what you truly want instead of what you are willing to settle for out of fear.